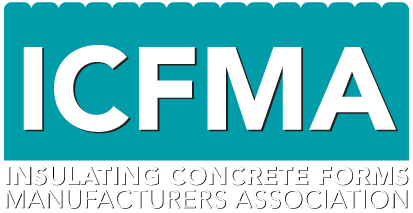 The Insulating Concrete Forms Manufacturers Association (ICFMA) recently commissioned CLEB Laboratories (formerly known as Air-Ins Inc.) to conduct the first in a series of accredited whole wall thermal studies. This installment compared a 2” x 6” traditional insulated wood frame cavity wall to a standard 6 inch (150mm) core insulating concrete form (ICF) wall. 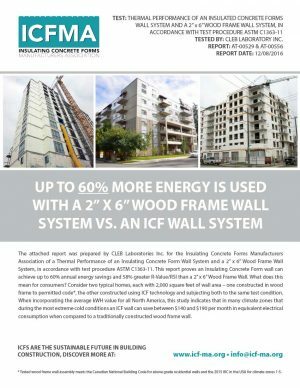 The study was overwhelmingly revealing; confirming dramatically superior energy-efficiency performance and an overall better R-Value/RSI demonstrated by the ICF Wall assembly. For decades, the ICF Industry has been asked to provide definitive proof that thermal mass, the air-tightness and continuous insulation features of ICF walls deliver real, quantifiable benefits in terms of overall energy-savings and achieved R-Values/RSI. Many studies have been conducted in the past by the Portland Cement Association (PCA), the Canada Mortgage and Housing Corporation (CMHC) and the Department of Housing and Urban Development (HUD) all of which were either based on limited field comparisons or thermographic computer modeling. This is the first time a SCC & IAC Accredited, and Internationally recognized testing facility has been commissioned to evaluate a realistic side-by-side comparison of the two types of wall assemblies within a single study. What does this mean for consumers? Consider two typical homes, each with 2,000 square feet of wall area – one constructed in wood frame to permitted code*, the other constructed using ICF technology and subjecting both to the same test condition. When incorporating the average kWH value for all North America, this study indicates that in many climate zones that during the most extreme cold conditions an ICF wall can save between $140 and $190 per month in equivalent electrical consumption when compared to a traditionally constructed wood frame wall. * Tested wood frame wall assembly meets the Canadian National Building Code for above grade residential walls and the 2015 IRC in the USA for climate zones 1-5.